Slow Cooker meals are not only perfect for busy weeknight dinners, but also great for weekend entertaining too! 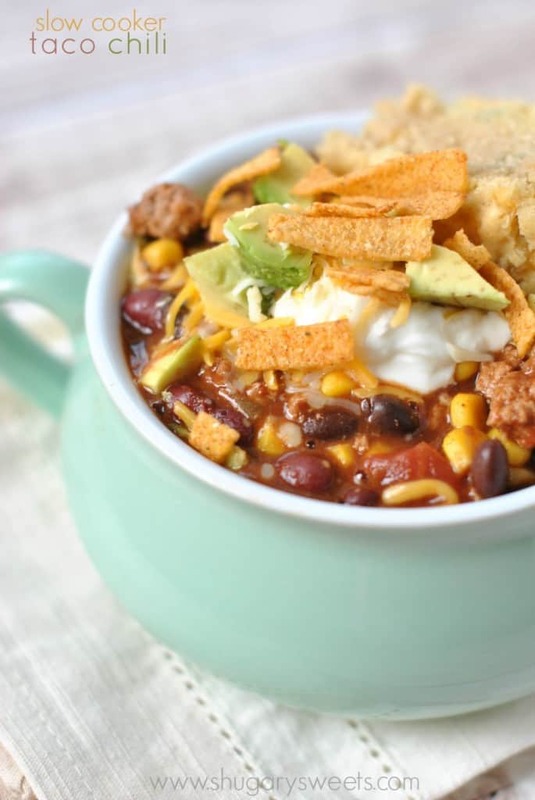 This Taco Chili recipe is so flavorful. Serve it up with a side of cornbread and all the fixings! I know when some people think of slow cooker meals, the image that comes to mind is Boring. Bland. Ugly. My friends, your Slow Cooker meals do NOT have to be like this! 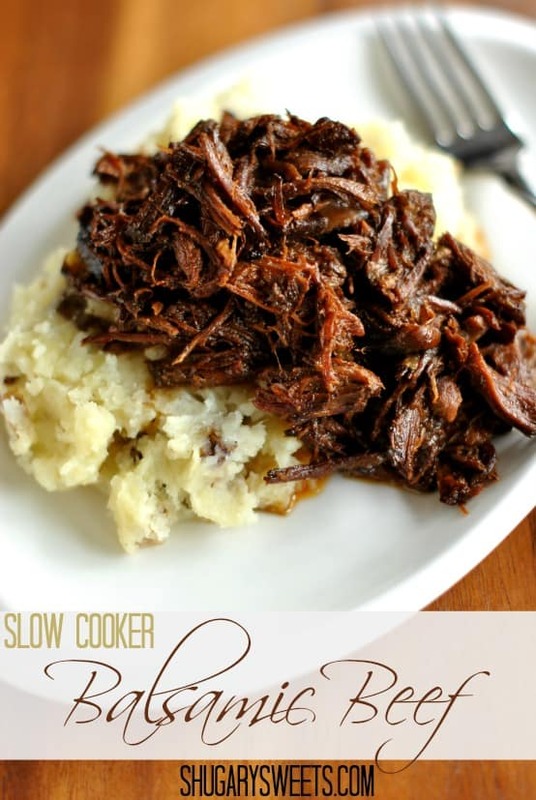 I love using my slow cooker and I try to pull it out at least once or twice a week, sometimes more! I love recipes that I can toss all the ingredients into the pot and walk away for hours. Recipes that when they are finished, there’s no fussing. Today’s recipe is just that…an easy, delicious, flavorful chili. I used ground turkey to make this on the healthier side. I also used my homemade taco seasoning mix to give this chili flavor. If you’re using store bought packets you may want to adjust the salt in this recipe. Those packets tend to be quite salty! I used plain greek yogurt instead of sour cream on top of this chili. I also added a pinch of low fat shredded cheese, chopped avocado and some southwestern tortilla strips. Of course my attempts to keep this healthy were completely awash since I served this with a big side of Jalapeno Cheddar Cornbread. But it’s all about balance, right? I’m pretty sure this would make a great meal to serve at a potluck. Or family event. Make a big batch and have bowls of all the toppings on the side! Of course, don’t forget the cornbread. You have to have your carbs after all, right? ENJOY!! 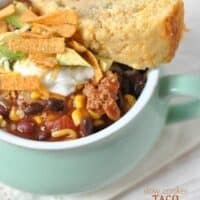 What do I need to make this Slow Cooker Taco Chili? Ground Turkey. You can use ground beef if you prefer. 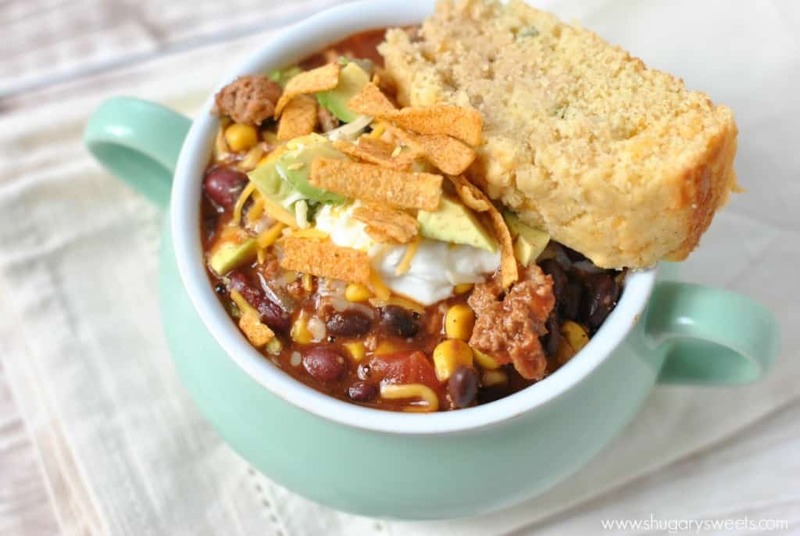 Or try my Slow Cooker CHICKEN Taco Chili recipe! Slow cooker. Crock Pot. Whatever you call it! Here’s my favorite on Amazon! Here are some of my favorite SLOW COOKER recipes…. Why list them individually. Check out this great collection of all my favorite Slow Cooker Meal Ideas! Looking for more tex mex? Hearty and flavorful, this fix it and forget it Slow Cooker Chicken Enchilada Chili recipe is delicious! If you LOVE this recipe, be sure to share it on Instagram and tag me #shugarysweets so I can see it! In a large slow cooker, combine cooked ground turkey, corn, beans, salsa, tomato sauce, salt and taco seasoning. Make sure to add the liquid from all your cans of corn and beans! Give a quick stir to combine the ingredients. Cover and cook on low for 6-8 hours. Serve hot with plain greek yogurt (or sour cream), cheese, avocado and tortilla strips! ENJOY. 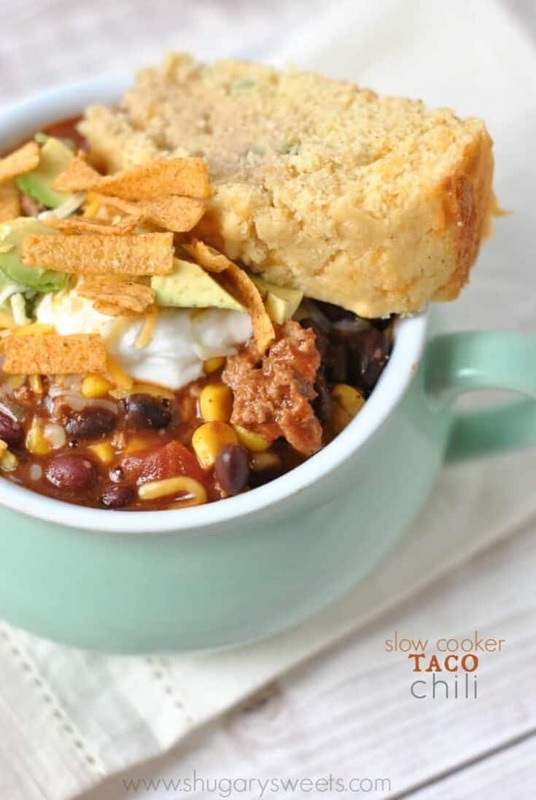 Today’s recipe for Slow Cooker Taco Chili was originally published on Shugary Sweets on February 14, 2014 and has been republished in September 2018. I love putting teasers on instagram!!! Come on over for dinner! Ohhh….that’s a good looking chili Aimee! Love the taco twist and I’m sure my kids would too. It was a delicious, fun twist for sure! Thanks Melanie! I have been traveling a lot for work lately and the one constant has been cold weather. Good thing most restaurants have chili. I have gotten my full. I bet this version is about 100 time better though. I am thinking a deserve a big pot this weekend. Looks delicious! I love slow-cooker meals. We have that totally in common Stephanie! This taco chili is truly calling my name! I hear it too!! Haha!! This looks delish! I can’t use canned ingredients because I only get 500mg of sodium/day. But I could use dried beans and frozen corn and totally do this without using 6 days worth of sodium. hahahahaha. Love your posts. Thank you Maralyn! Let me know if you try it and the substitutions you use (future readers may be interested)!! It does take a few extra minutes prep, but it’s so worth it at dinner time!! The greek yogurt was a delicious twist, I’m so glad I tried it! So easy, so good. It’s a great recipe for beginning/aspiring cooks! Or those of us who just want something delicious that doesn’t take a lot of time. It appeals to so many, you’re right! And my husband said Pepperjack Cheese gives it good flavor too (too spicy for me)!! Isn’t the slow cooker the best? Especially with chili. 😉 And now taco chili – seriously, tacos in chili? I think I just found my happy place! I’m happy to help! And yes, I heart my slow cooker! I am always looking for new things to cook in my slow cooker! this looks amazing! Thank you Nancy!! Let me know if you try it!! This just made me really hungry! One thing I love about winter time is chili and this looks fantastic! We just had slow cooker regular chili for dinner last night. Next time I definitely want to try this! This Taco Chili looks fantastic! ANd that cornbread on the side is a perfect companion for this dish!! Thanks Renee!! They really do go so well together! We got about 7 inches of snow this morning so it is definitely a chili kind of day! This looks delicious! Thanks for sharing my slow cooker baked potatoes. Love this taco chili! It looks fantastic and perfect to warm up with. I love that it’s made in the slow cooker too! Just pinned to my “Slow Cooker Ideas” board, which I’m trying to build up. Thanks! Thank YOU for pinning David. Sounds delicious! I’m a fan of chili and taco so the combo sounds perfect! Pingback: 9 Easy Slow Cooker Recipes to Make for Tonight’s Dinner | Everyfoodrecipes, cooking tips, and how-to food videos—all rated and reviewed by millions of home cooks,make the perfect birthday cake, or plan your next holiday dinner. Made it with vegitarian crumbles. It was wonderful and no-one knew it wasn’t real meat with all the flavors! This was absolutely delicious. I made it exact to the directions except we added Fritos corn chips instead of tortilla strips. So glad you liked it! Fritos are a great substitute!! look delicious yum!! but one problem i don’t have a slow-cooker so how should i cook this normally until the meat is cooked? Totally random question – where did you get that double handle soup crock? Love the color! No worries on randomness 🙂 I bought these from Cost Plus World Market online. Happy Shopping! Has anyone tried freezing these ingredients together? I have to go to a crock-pot meal exvhange eith 10 zipper bags full of frozen crock-pot ready meals! Yes, this would totally work for freezer cooking! I made this for dinner tonight and it was DELICIOUS!!!! I couldn’t believe how easy it was to put together, and it was so inexpensive. I probably spent about $12 on the ingredients. Thank you!! Could you cook this for less time on High? I’m looking for something that would take more like 4 hours. Yes absolutely! This recipe is quite flexible for cooking on high! When doubling is it ok to double everything- including all the liquids? Could you cook the ground turkey right in the slow cooker with the rest of the ingredients? So glad you loved it 🙂 Thank you for sharing! Thank you for such an easy and delicious recipe! My kids don’t like chili but they will eat this one. I save this for a lazy day cause its just so darn easy. I don’t bother with the slow cooker cause I can’t ever plan ahead enough so I just brown the turkey in a pot and then dump everything else in and cook for a bit and it comes out great! I also just buy a packet of taco seasoning and use the whole thing instead of measuring. It’s salty enough so I don’t add any additional salt. When serving I add a little shredded cheese, sour cream, maybe include a salad or even cornbread if I have the time to make it and it’s a great meal. I can’t believe that 7 staple ingredients in one pot makes something that everyone loves! Thank you for a beautiful cooker taco chili recipe. Made this tonight for my family and the kitchen smells divine. It tastes even better. Yum! I’ve been ready for soup season since about July 5th! Can’t wait to try this one — I love the Ninja too! It’s the best. Thanks, Aimee! 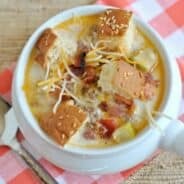 Nothing better than a slow cooker soup in the fall! Yum! 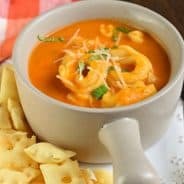 I love simple and delicious recipes! 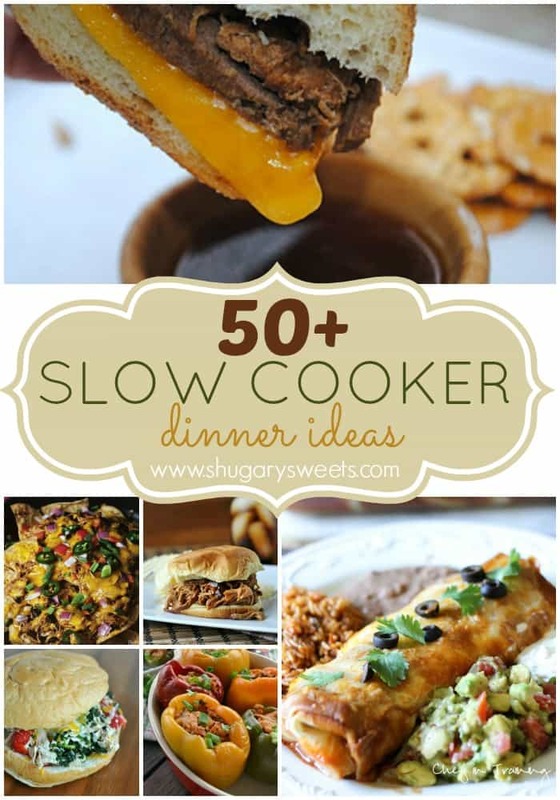 Always looking for a slow cooker meal! Have this recipe on the menu for the week and I am going to make the jalapeno cornbread too! Great recipe!! Okay this officially just became what I want for dinner tonight! 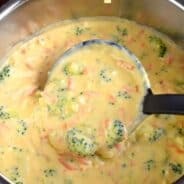 My family LOVED This recipe – it is going to make the weekly menu! Thank you! Could I leave out the meat all together?